Time for another episode of Samuel In Dolgnwot. 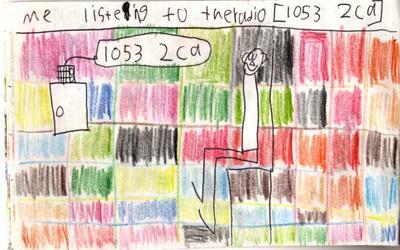 Today we can see Samuel listening to the radio, in fact, 1053 2CA. He must be listening to a future broadcast as that station didn’t exist in 1857! This would probably have been during a time that Samuel wasn’t searching for gold…he can’t possibly search 24 hours a day can he? Tommorow we have another double image special of Samuel In Dolgnwot.